5L1120 FHP V-Belt | Light Duty 5L-1120 V Belt, Consumer Brand. 5L1120K FHP V-Belt. Kevlar reinforced. 5/8” W x 112" Overall Length. Consumer Brand (belt number print may vary). GATES 31120/5L1120 Truflex V Belts. 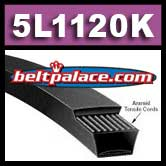 Classical B109K V-Belt on lawn and garden applications. Jinma Rotary finish mower belt (select Models, see manual).